Rep. Gohmert (R-TX) describes rise of global Islamic Caliphate. On Wednesday evening, Senator John McCain (RINO-AZ) was on NBC Nightly News and was asked what he thought about Congressman Louie Gohmert (R-TX) suggesting that he was supporting Al Qaeda-linked groups in Syria. To this, McCain responded that he considered Rep. Gohmert to be a “person of no intelligence” – clearly suggesting that Gohmert was dim-witted and not worthy of dealing with. And, what does the former PLO terrorist Walid Shoebat think of John McCain and Louie Gohmert? “When it comes to McCain’s support for the Syrian rebels, the most damning evidence begins with the group he aligned himself with – the Syrian Emergency Task Force (SETF) and its one-time member Elizabeth O’Bagy, whom McCain has amazingly decided to hire. We have written extensively about the SETF, which is steeped in Muslim Brotherhood affiliations that McCain should not be allowed to plead ignorance over. In fact, Gohmert should be getting reinforcements from within the Republican caucus. Then again, he’s quite familiar with being abandoned on this front. “Of course, McCain is doing exactly what someone who has been busted usually does; he smears his accuser. Why else would McCain defend the likes of Reid, Schumer, and Durbin while accusing Gohmert of having ‘no intelligence’? McCain also shamelessly sided with the Muslim Brotherhood after the Egyptian military overthrew the regime of Muslim Brotherhood tyrant Mohamed Morsi. McCain lamented the deposing of this tyrant and called for the military to release Islamists from prison. Now, why would McCain support the Muslim Brotherhood over a pro-Western Egyptian military? And, why would he hire Syrian Islamist propagandist Elizabeth O’Bagy to become one of his legislative assistants – after she was exposed for lying about her Ph.D. and being a paid shill for Islamists seeking to overthrow President Assad of Syria? 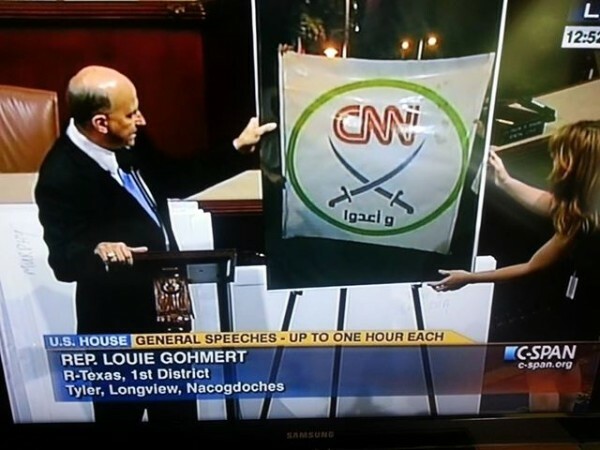 As former terrorist Walid Shoebat explains, Congressman Louie Gohmert should be getting reinforcements from the more conservative elements in the Republican Party. But will he? Frankly, we doubt it. Congressman Gohmert deserves our praise, our vocal support and our prayers for having the courage to hold another Republican responsible for promoting muddle-headed national security policies that endanger the lives and freedoms of millions of Syrians and Egyptians who do not wish to live under an Islamic dictatorship. “Progressive” American politicians like McCain, Lindsey Graham and Barack Hussein Obama are pushing for policies that are only benefitting the Muslim Brotherhood, Al Qaeda, Al Nusra, and dozens of other terrorist organizations operating throughout the Middle East. Oh, but we forgot. According to Obama, we’re not at war with Islam nor are we even fighting a “war against radical Islamic terrorism” under his watch. No, but under his watchful eye, we’re seeing the expansion of Islamic tyrannies around the globe – and those who oppose it are smeared as being dim witted. Thank God, we still have politicians like Congressman Gohmert who are rational and clearly understand the dangers our world faces from “progressives” and from their Islamic terrorist allies who seek to establish a worldwide Muslim dictatorship. Read more: Senator McCain Visits With Syrian ‘Rebels’ – Terrorists; Louie Gohmert shoots back at Wacko Bird John McCain; Sen. John McCain’s ‘Syrian Rebels’ Kill Teen For ‘Heresy’; Christians Face Massacres From Syrian Terrorists.